We make it ALL - Frame > Foam > Coverings. Plasma Cut and Jig Welded Parts for Accuracy and Strength. Plate Bolted Recliner Mechanisms Not the weak "Made in China"
bolt through frame design used by the competition. Includes 7 inch Slide Tracks. 4 No-Sag Springs Placed from Front to Back for Full 4 Spring Functionality. All Material Comply with DOT FMVSS 207 Safety Standards per sections S4.2, S4.3. 3 Year Warranty on the Frame and Coverings with 1 Year on Everything Else. 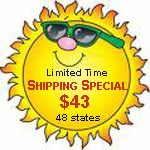 IS THIS SEDONA LR SEAT FOR YOU ? One of the Best Work Van Seats Available. A basic minimum seat for Larger People. Multi Position Recliner Folds Back and Forward. Options Available for Larger People. The Design of the Sedona LR RV captains chairs were intended to create a fine rv furniture class system among the RV community. The added sporty look with accented piping trim and available contrasting cover give these chairs that stand out look. 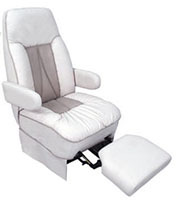 These RV furniture motorhome seats are known in the Industry as the Premiere Luxury captains chairs. Recreational Vehicle Seating division has nurtured the development of these RV captains chairs from its conception to be the determining factor in the Luxurious Driving Experience. The Sedona LR RV captains chairs are ideal for the lengthy periods one must sit on a long road trip as well as relaxing with friends upon arrival at your destination. One look at the Sedona's enticing curves will confirm what our Design Team has proclaimed all along. The De Leon II RV captains seats like all our RV furniture, is available in Ultimate Leather, which is as soft as calfskin, yet cleans easily with mild soap and water. We recommend Saddle Soap. These seats are made to mount to an after-market swivel or fixed base and is set up for a 8x11" and 14x11" bolt patterns. Chevy Class B or C will require a bolt pattern adapter and Ford Class B or C will need a base change. All rv furniture is also available in cloth.